If you get in Erika's house, you have immediately the sensation of a small, relaxing, bright and fresh world. In the living room, an open space including the kitchen of approximately 75 square metres, the feminine touch has guided every choice in decor and seems playful, amused and light, with a combination of modern style and Provençal or shabby chic. 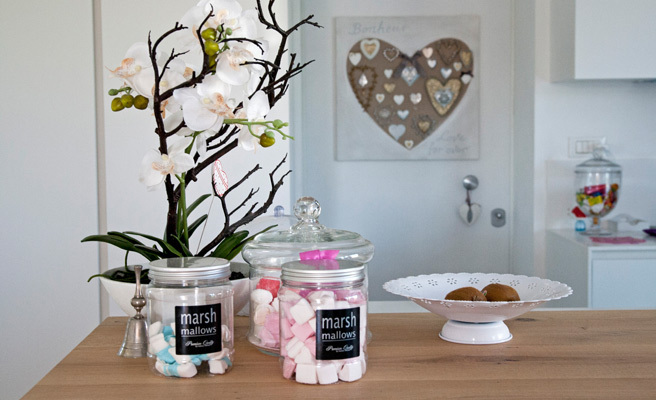 You will, therefore, find vases of coloured marshmallows standing out from the strictly all-white, minimal kitchen. Or the bare walls, which are refined with wooden, iron and wicker hearts, collected from markets or made by hand. 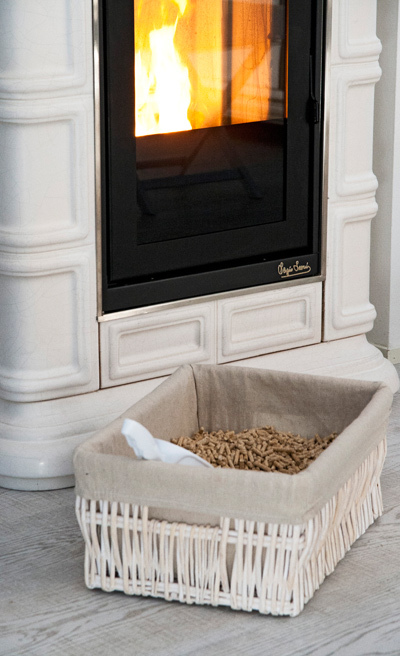 Or, lastly, instead of a standard wood-burning fireplace, a hyper-technological pellet stove with a vintage touch. "The manufacturing company had already set up the flue according to specifications", Erika explained "In my previous house I had a wood burning fireplace which I loved, but I didn't like the thought of having to load, clean and manage it on my own in my new house." 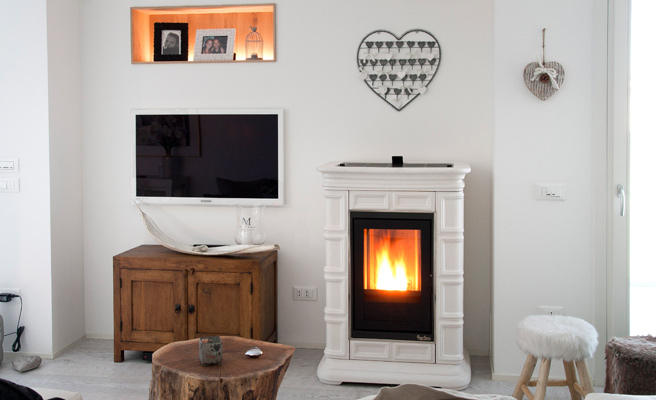 The solution of the pellet stove, at least from a practical standpoint, seems to be the best: it switches on and off automatically with a remote control, it is easy to load and clean, it means less dirt in the house and only a few sacks of fuel in the garage. It's a pity that Erika was only able to find square, metal pellet stove models on the market. When it was installed, my friends and family were speechless. 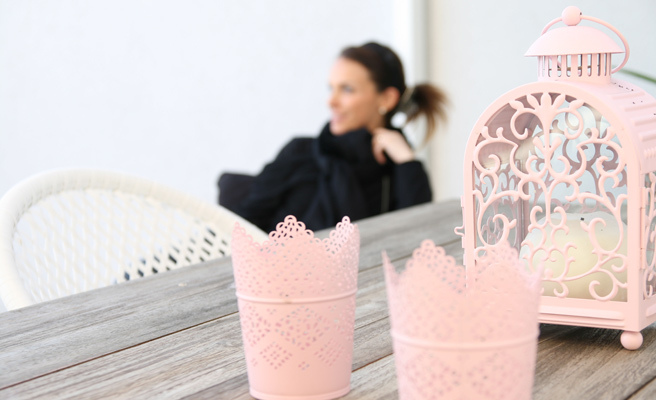 The white, hand-crafted ceramic of Marlene is a perfect match for the rest of the decor. It was no coincidence that Erika chose the craquele finish, a type of treatment that highlights the small natural cracks of ceramic, giving the stove a spot-on vintage appearance. The wide, soft flame is strong competition for wood-burning fires. 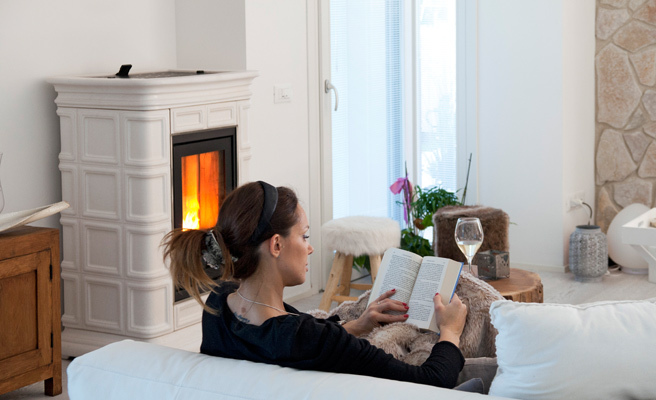 It runs very quietly because Marlene, unlike normal pellet stoves, heats without a fan, through natural convection. It is designed to exchange as much heat as possible with the room. Even without forced ventilation, in well-insulated buildings such as Erika's house, it can heat up to 85 square meters.